The former World of Warcraft devs who formed Frostkeep Studios are bringing their new multiplayer survival title, Rend, to the PC Gamer Weekender. It’s a 60-player competitive survival title where three factions of 20 players try to outlast their opponents, in matches that can last... well, months. 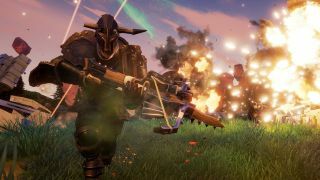 We actually had a look at Rend earlier in 2017—check out the PC Gamer preview here—in which the game was described as “a survival game that blends the RPG progression of World of Warcraft and the competitive nature of League of Legends with a gooey survival-game filling as its heart”. You can find out more about how Rend is coming along by checking out Frostkeep’s Twitter and keeping an eye on its Youtube for future updates. And if you want to sign up for a spot in Rend’s pre-alpha, head on over to the official site for more details. Along with Rend’s massive survival action, you’ll be able to see many more speakers, games and booths all at the PC Gamer Weekender, which is being held February 17-18 at the Olympia, London, in the UK. For more details see the site, and follow us on Twitter for up-to-the-minute news. Tickets are available now from £12.99. Use the code PCG to get 20 percent off tickets.